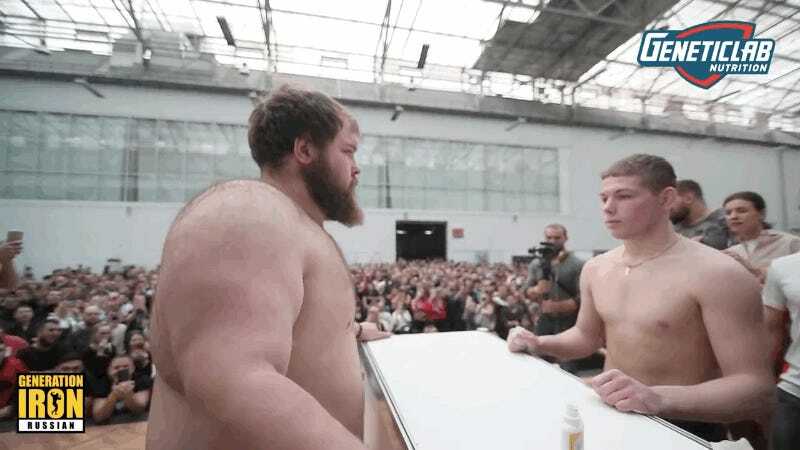 In addition to the standard bodybuilding competitions, dumpling eating contests, and dance battles, the Siberian Power Show last weekend in Krasnoyarsk, Russia, also hosted a “Sport slapping tournament for men,” with 30,000 rubles ($465) at stake. The event may have cribbed the idea from the Sarychev Power Expo, which hosted a similar competition last year. It’s exactly what it sounds like. Two dudes line up across from each other with a lectern in between them. They take turns slapping the daylights out of each other until one concedes or is knocked out. Vasily Kamotskiy, the bearded dude seen below, won the grand prize after smacking several woefully underpowered foes. Generation Iron has a longer highlight reel, if you’re so inclined. Slapping contests, team obstacle MMA, knights in a wrestling ring ... has Russia ever come up with a bad idea?